BALTIMORE, MARYLAND – The intellectuals are laying the groundwork. That is, they’re digging the foundations for an extraordinary structure – a tower of debt higher than any ever seen in world history. The primary architect? Paul Krugman? Jerome Powell? Joseph Stiglitz? Nope. Not an architect at all… but a politician. He built his very own 13-X private database to mimic how the ultra-rich practically mint money. It’s none other than Alexandria Ocasio-Cortez (AOC), the ambitious young representative of New York’s 14th district, who has the shovel in her hands. She may be the youngest woman ever elected to Congress, but she wasn’t born yesterday. And she may not know any more about economics than Donald J. Trump. But she knows a winning trend when she sees one. And circa 2019, debt is becoming more popular than internet hook-ups. Our dear readers generally approve when we poke fun at liberals like Ms. Ocasio-Cortez. But they hate it when we talk smack about the president. Many see the contest in Washington as a fight between good and evil. And they know what side they’re on! We predict, however, that AOC and DJT will soon be on the same side. Beyond good and evil. Just dumb. Both are already “low-interest kind of people.” And when the going gets tough, both will come to love Modern Monetary Theory, MMT… and $2-trillion federal deficits. So far, the “Citizen Score” has been tested in 40 different international cities. But is it happening right under our noses, in AMERICA? One of our dicta here at the Diary: People come to think what they have to think when they have to think it. Markets make opinions, in other words, not the other way around. And markets are running into trouble. The trends that were so felicitous for so long – falling interest rates and rising stock prices – have now stalled, or even reversed. 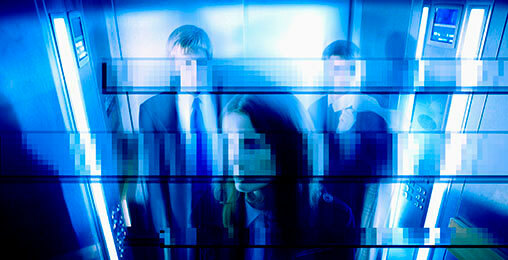 The private sector faces a recession. Wall Street sees a bear market coming. In Washington, tax receipts will fall… as costs continue to rise. How to keep the jig up? The politicians – left, right, and center – will come to see: debt isn’t so bad! What were those previous generations thinking, they will wonder? Scrimping and saving, balancing budgets, making trade-offs – and for what? The silly duffers didn’t know any better. A government can issue debt to pay for whatever it likes. It can pay to fight a war, to lower taxes for a preferred group, to soften the sharp edges of a recession. The United States has, in fact, issued debt to pay for all of these things. American politicians say that public debt crowds out private investment, that it’s unsustainable and will turn the country into Argentina. Or Greece. Or now, Venezuela. But regardless of what they say, what American politicians do is vote for more debt. The FT is right about that. Year in, year out… boom or bust… Democrat or Republican – they voted for more debt. Modern Monetary Theory is at least realistic about it. Noting that politicians are not shy about going into debt – without any horrible consequences; not recently, at any rate – the MMTers fantasize about a world in which government can get as much money as it pleases. Debt shouldn’t be a limitation. A government issues money, they reason. Why does it have to borrow at all? This seemed like such a breath of fresh monetary air that many economists and politicians practically hyperventilated. Here was a theory that seemed to validate a widespread practice – spending more than you earn. It was the feds’ money to begin with; why shouldn’t they spend as much as they want? Ms. AOC is often posed the question directly. She favors free universities, free healthcare, free this, free that – “How can we afford it?” ask skeptics. “We” don’t pay for anything. The feds pay… with resources that – one way or another – they’ve squeezed out of us. In theory, it doesn’t matter how they get it. Debt. Taxes. Inflation. Take your pick. 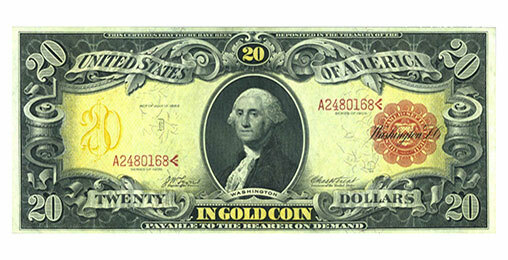 13 U.S. States Legalize “New Gold Standard”? 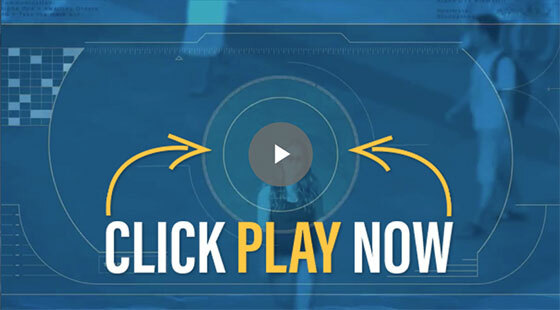 One man involved in the discussions reveals what he’s learned, along with a potentially explosive opportunity – the same kind of opportunity he used to bag a 14,354% winner. What really counts is the total amount of resources the feds take. The more they squander, the less is left for real output and growth. And the practical advantage of debt over inflation (just printing money) is that it limits the take. Borrowed money has a cost. The more the feds borrow, the higher interest rates go. Then, the economy slumps… tax revenues decline… and the feds are worse off than ever. Then, of course, the feds finagle a fix, getting the central bank – the Fed – to buy up their debt, so interest rates don’t go up. This ends up being very close to a pure MMT or Chartalist system, where the feds are, in effect, printing the money to pay for their quack programs. But the central insight of MMT is deeply flawed. It confuses the feds’ “money” with real money. MMT admits that their spending is limited only by the resources available in the real world. But that is why we have real money in the first place – to make sure the limits are respected. Fake money only works for as long as it mimics real money; that is, only so long as it respects the limits of real resources. After all, a car is not a car because the feds say it’s a car; it’s a car because it takes you where you want to go. And as soon as the feds’ money stops taking you where you want to go – like Zim dollars in Zimbabwe in 2006 or bolívars in Venezuela today – MMT falls apart. The feds could “print” all they wanted; it wouldn’t buy them a ham sandwich. Fortunately, the U.S. dollar still has some miles left on it. But with politicians like AOC and DJT at the wheel, it’s just a matter of time before the limits come off… and it ends up in a ditch. P.S. Dan Denning, our coauthor on The Bill Bonner Letter, has been following the developments of MMT for some time. In order to pull it off, Dan says, the feds must have complete control over the money supply. He sees private banks shuttered… cash outlawed… and bitcoin “assassinated.” Dan gives all the details, and what it means for you, right here. “Buy the index and sit tight.” As an investor, you’ve undoubtedly heard that advice. Passive index investors believe buying an index of stocks will outperform investing in mutual funds, hedge funds, and other asset classes. Most passive junkies I speak with assume 8% annual returns. They accept that it may be lumpy, sure. But that 8% number is sacrosanct. That’s how the market has done over time for many years, after all. Low- and zero-fee passive index investing is a fraud. Let me prove it to you. The assumption of an average annual return of 8% is often put forward after examining hundred-year charts, where a hypothetical investor held onto the index for a century. But as my colleague, Dan Denning, showed you on Wednesday, you’re not a hypothetical investor. You live in the real world. You don’t have 100 years to sit on an index. You need decent returns over a matter of years, not decades. Over the past 20 years – and that’s long term in my book – the S&P 500 has grown at an annual rate of 5.6% – including dividends. The passive investors I speak with are U.S.-based. And they’re referring to U.S. Indices. That means the S&P 500 or Dow Jones for larger companies, and the Russell 2000 for smaller companies. Now, what about outside the U.S.? 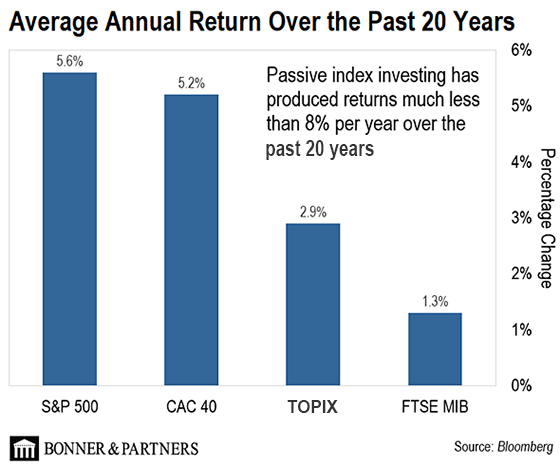 How has passive worked out? If it’s so great, it should work everywhere! Right? Japanese stocks, as represented by the TOPIX Index, provide one example. Over 20 years, the TOPIX is up only 2.9% per year. That’s really a pitiful result. To my passive friends, I say: Huh? Things are a little better in France, as represented by the CAC 40 Index. Over 20 years, this index is up 5.24% per year. Not bad. But still not 8%. In Italy, the world’s ninth-largest economy ranked by GDP, the results are just plain bad. Over 20 years, Italian stocks, as represented by the FTSE MIB Index, are up 1.3% per year. That 8% number my passive friends point to is just not correct. That’s not how the market has done in many countries and many markets. So what are the passive investors to do? What options do they have? They should follow an approach as old as capitalism… investing like a businessman. Stock prices are not pixels on a computer screen or randomly selected numbers. They are a signal. And they signal to a potential investor what the market says a company is worth. Blindly buying a basket of individual stocks in an index is not investing. I don’t know what it is, but it’s certainly not investing. Price is what you pay in the stock market, but value is what you get. Every asset with cash flows has some range of values. My strategy in Bonner and Partners’ Focus is to buy stocks below this range of value. Ideally very far below this value. We want to buy a dollar for 50 cents. And right now, we’re finding lots of 50-cent dollars. Active management – specifically in the smaller, overlooked companies, where we focus – is the key to investment success over the long term. And that’s exactly what we do – and will continue to do – in Focus. As Bill wrote recently, Japanese stocks have had a hard few decades. After crashing in 1989, Japan’s Nikkei 225 Index is still 50% below its all-time high. But there may be reason for optimism for Japanese investors. Consumer spending among Japanese youths is picking up, and that can translate to higher stock prices. I have long suspected that Bonner is one of the “Liberals in hiding” due to his constant running down of the president. And maybe he is one of the Deep State who think they should be making all the rules that control the people and trying to tell us how to live our lives. Either way, he runs his mouth off too much about Trump, while not giving him credit for all the great things he has already done for the majority of law-abiding people in our country – much more than Zerobama did in the eight years he was in office and constantly tried to turn this country into a socialist nation. It was very sage of you to pose the question to your dear readers about which group they would prefer to see approaching them in the middle of the night in Baltimore – three illegal immigrants getting off from work, or three Americans? The MAGA cap-wearing Trump-worshipers among your dear readers, who demonize undocumented aliens, would do well to remember that every act of domestic terrorism and every mass shooting carried out on American soil was carried out by white, male Americans. The only two exceptions of which I am aware were the 9/11 attack and the shooting at the Marjory Stoneman Douglas high school in Parkland, Florida. The former was carried out by middle-Easterners, with Saudi Arabians in the majority. The latter was carried out by a homegrown Hispanic youth. What is the premise for opening our borders? To help the world in general? Those that come in are a grain of sand in the scheme of things. Billions in this world have nothing. We don’t improve the masses in any meaningful way since most cannot even make the effort to get here. So what exactly is being accomplished at our southern border by building a wall, or not building a wall? I’d like to know. Bill, when it comes to the wall and the illegal immigrant flow, I can tell you it is a problem. I live in Texas, where I see great numbers of illegal immigrants who come here in search of a better life. While it may be true that of the number of illegals caught, only 2% have criminal records, I am not sure how they determine that. We have a big number of criminals in the U.S. who have not been caught and technically don’t have a criminal record. How do other countries keep track? What is a crime in those countries? Most of the illegal immigrants coming to Texas are not Mexican, but are Honduran, Nicaraguan, Guatemalan, and from other countries beyond Mexico. Are we actually tracing where the illegals came from when they are caught so we can determine if they are criminals? What percentage of illegal immigrants who come across the border do we actually stop – 1%, 5%, 10%? I suspect the number is very low, because they cross in the most desolate areas of Texas. Do you know how many immigrants I have seen walking down a sendero while I am hunting in low-populated areas? A lot. With our resources stretched to watch our long southern border, I suspect we catch 1% or less of the illegal immigrants making their way to this country. So if we take that less than 2% with a criminal record and apply it to the 99% we are not likely catching, the criminal content becomes a much bigger problem. Bill, as usual, I have to write to argue over how much we agree with one another (I guess that’s just what libertarians do). I can disagree with nothing you wrote here. I only wanted to add something that I thought of as I read this. Rather than spending a few hundred billion (with a “B”) building a wall in an effort (destined for failure) to save us from having illegal immigrants overwhelming our welfare system, why not save not only that money, but the billions that are wasted on our welfare system, by privatizing it? I know you already know where I am going with this, but I’ll go through the obvious anyway. With a privatized welfare system, there is no incentive to waste money just to get next year’s budget approved, as there is with a government welfare system. And as such, illegals would be disincentivized from gaming that system. And for the record, I consider not only our “paychecks for nothing” programs to be welfare, but our current medical system and education system as well. As the Cambridge Analytica scandal showed, Big Tech companies like Facebook gobble up mountains of user data for unclear reasons. Dan Denning, Bill’s coauthor on The Bill Bonner Letter, thinks he knows the ultimate end: complete control. Get the full story right here.